Horace Lloyd Baker obituary. Carnes Funeral Home. Horace Lloyd Baker “Bud” or “Buddy” to family and close friends, age 80, passed away on August 25, 2018 (his beloved wife’s birthday) in Richmond, Texas where he resided at Richmond Healthcare Center. He was the Widower of Lynda Lee Martin Baker. They shared 53 years of marriage together. Born in Hale Center, Texas on November 10, 1937, he was the son of Horace L. Baker and Alma Ruth Parnell Baker. He attended Howard Payne College where he played football and was a lightweight boxer. 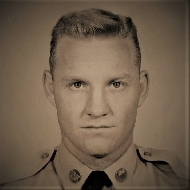 He later went on to serve his country in the United States Army. During his eight years of service he was stationed oversea in Korea and in Germany. After being honorably discharged from the Army, he and his wife moved to Oklahoma City, where they had their first child a daughter, Kelley Elise Baker. He then moved his family to Abbeville Louisiana in 1967. Once in Abbeville he and his wife had their second child a son, Conrad Lloyd Baker in 1968. Bud started his own drill pipe company, Pipe & Supply Inc. in Lafayette, Louisiana and they remained living in Abbeville until 1987 when they moved back to their home state of Texas to be closer to their first grandchild. Bud enjoyed spending most of his time with his family especially his grandchildren who called him “Daddy Bud”. He loved making his famous “Daddy Bud” milkshakes for his grandchildren and taking them on rides in the golf cart. He will be remembered for his infectious smile that would light up any room and always having some type of saying like “I’m in your corner”. He always had a silly riddle like what weighs more… a pound of feathers or a pound of lead? He liked telling jokes and always had a story or “tall tale” about when he was a young boy. He was predeceased by his parents and his two older sisters, Bertha Bennett and Maxine Jenkins and his loving wife Lynda Lee Baker. He is survived by his two children, Kelley Elise Baker Whaley and her husband Kody E. Whaley and Conrad Lloyd Baker, his four grandchildren, Lauren Alyssa Black and her husband Steven A. Black, Justin Rene Gonzales (serving in the United States Navy), Catherine Darlene Ducharme (serving in the United States Navy) and Chantelle Renae Ducharme, with one great granddaughter Rylee Renee Black due to arrive in December as well as his two nephews Leon Gray and wife Nancy and Bobby Bennett. The memorial service will be held on September 14, 2018 at 2:00pm (sharp) at Houston National Cemetery with Military Honors located at 10410 Veterans Memorial Drive, Houston, TX 77038. Although we will miss him deeply it does bring a feeling of comfort and a sense of peace knowing he has been reunited with the love of his life. He will always be in our hearts.